Previous postShould mental health disorders be treated with medications? Next postGuest Post – Why Talk About Mental Illness? I hope it is ok that I linked your blog on my latest post. The less we blame ourselves the better. I am also dealing with those unwanted thoughts. I talk openly of my BiPolar. I am not defined by it but I have accepted it as part of my life. It has made sense of a past that previously made no sense at all. Medication for it, is also a part of my life and is, most likely, something I will be on for the rest of my life. And, lets face it, there is enough external stigma on us without beating ourselves up. You are so right…there is plenty of external stigma to go around we don’t need to beat ourselves up too! Thanks so much for sharing the link. I plan to listen to the audio tonight. Greatly appreciate your comment. Stigma is fear of the Other. We need to see ourselves as whole person, not into the healthy me, or the sick me. 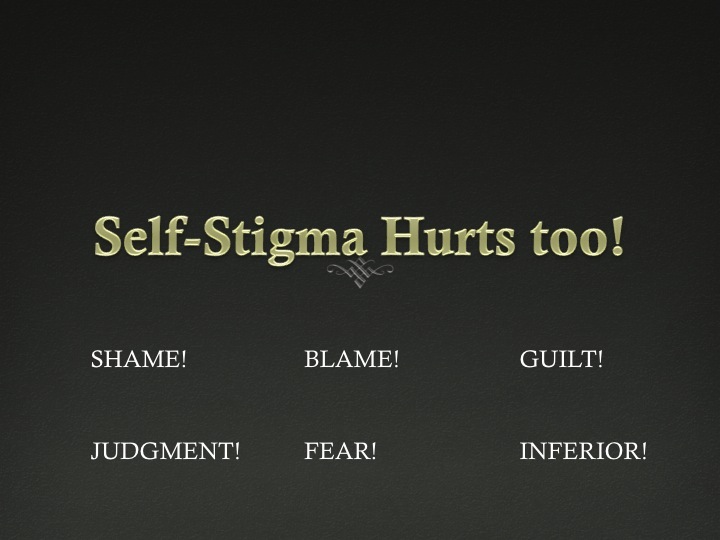 Self stigma is when we are afraid of the sick me. Interesting perspective. I like the explanation of stigma, but I especially like the reminder that it is important to see ourselves as a “whole person,” neither healthy or sick. That’s sometimes hard to do, but I see what you are saying.